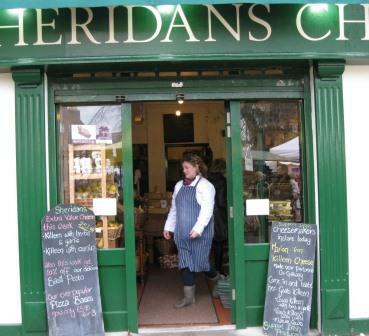 Galway food shops have been a ‘foodies’ paradise since long before the word was invented! 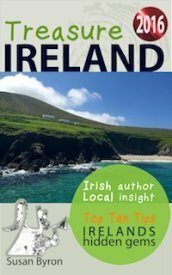 We have always had the finest and freshest food in Ireland but it’s only now that we are really beginning to appreciate it. What was originally deemed as bland, boring and downright rural, things like brown bread and porridge, are now totally desirable and healthy, we have always known they were good for us! 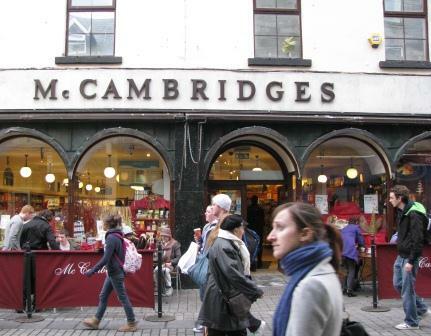 McCambridges of Shop Street is Galway’s original purveyor of epicurean delights, established in 1925, it is still a thriving hub of activity every day, thank God. It’s the kind of place you would go to get Lindt chocolate bunnys at Easter when they couldn’t be got anywhere else or a bottle of Cherry Brandy for your Granny at Christmas. You name it, they have it, from rare spirits and liqueurs, to the finest wines and bubbly. Chocolates too, including Skeiligs which (and I wont be challenged on this)are the finest in Ireland. 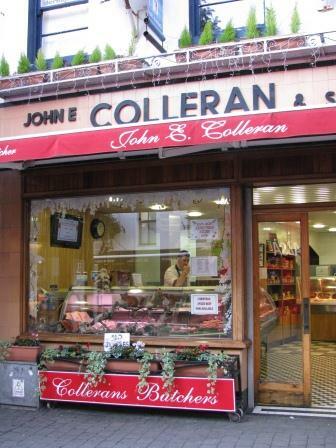 Another institution we are desperately proud and appreciative of is Collerans, the butchers on Mainguard St, which has the tastiest rashers and sausages to be found anywhere and that’s no mean feat these days with the rubbish that’s on offer in most supermarkets. What you get in Collerans hasn’t been plumped up with water and there are no nasty artificial ingredients in the sausages or pudding either. Long may they last, could be 3rd or 4th generation now, will have to check and get back to you on that. 1	Collerans Butchers Mainguard St, master butchers and the best rashers and sausages in Galway, if not Ireland. 2	Evergreen Mainguard St, deserves a mention as one of the best suppliers of health foods in Galway for almost 20 years, they now have 4 more branches which is not surprising seeing as they have the most helpful and well informed staff anywhere. 3	Foods of Athenry make great apple pies, a wide selection of breads including spelt and award winning mince pies several years in a row now, stocked most supermarkets. 4	Friendly Farmer pasture reared chicken seasonally, ducks at Easter and Halloween, bronze turkeys and geese at Christmas, from the Galway Market or online. 6	Gourmet Tart Company Abbeygate St Lower, wonderful tarts, sweet and savoury, carrots cakes and meringues to make your mouth water. 7	McCambridges Shop St, as above…they will also make up sandwiches freshly for you and have a coffee counter and outdoor seating area. 8	Mortons Salthill, similar to McCambridges above but out in Salthill they not only stock a great selection of food and drink but they prepare excellent take-out meals. 9	Olio & Farina Abbeygate St Upper, as the name suggests stocks lots of lovely Italian goodies.They also run monthly cookery demonstrations and wine tastings. 10	Solaris Botanicals Ballybane, but stocked in McCambridges (beautifully packed) they are award winning speciality tea blenders. Their Roobios Chocolate Chai blend is an excellent pick me up with their Green Tea being the most popular. And don’t forget the Galway Market on Saturday mornings, where lots of other Galway food producers have stalls, and you will be welcome to taste and swap stories.